Landscape Trencher | Trench'N edge. The TRENCH 'N edge landscape trencher virtually eliminates the high cost of cleaning up trenched material from lawns and planting beds. This revolutionary trencher blows the material directly onto tarps for easy disposal - saving you time and money. 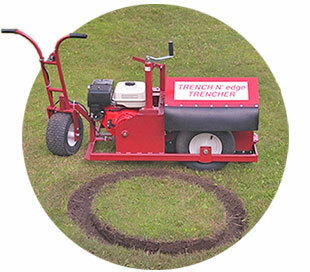 The Landscape Trencher was specifically designed for the landscape installation and maintenance industry. This portable, cost effective trencher allows the easiest way to install all types of landscape edging like stone, brick, plastic and modular concrete edging like SELECTedge border stones. Defining flowerbeds and tree rings. It is highly maneuverable for cutting tight circles and creating graceful, contoured landscape borders. The trenching teeth may be set for cutting up to 5 inches wide and the depth of the trench is easily adjusted up to 6 inches. It can also make a double pass to cut a trench 10 inches wide, which is the widest in the industry. This machine also eliminates the need to buy multiple blades for various widths and depths, which is required for fixed blade trenchers. The specially designed trencher teeth are made of replaceable carbide bits (available nationwide) that are mounted in forged steel holders. Excavating footings for smaller landscape retaining walls. Trenching for drain tile, lawn sprinkler systems, low voltage landscape lighting cable, water lines and root pruning.